We have recently finished work on a new solar water heating pump controller to be used where the array of solar water heating panels is split between an East and a West facing roof instead of the more typical single South-facing (in the Northern Hemisphere) solar array. 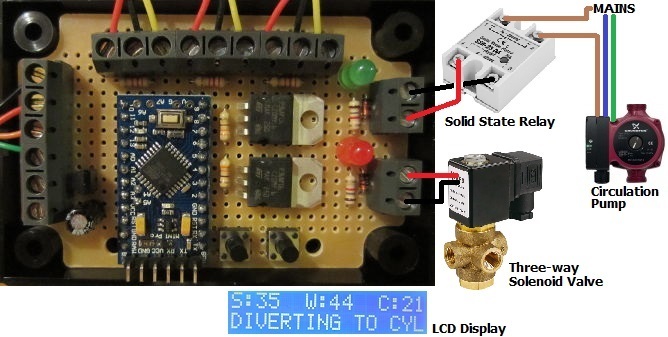 This controller has been based around our 2014 Solar Water Heating Pump Controller with Display with some additions and changes. 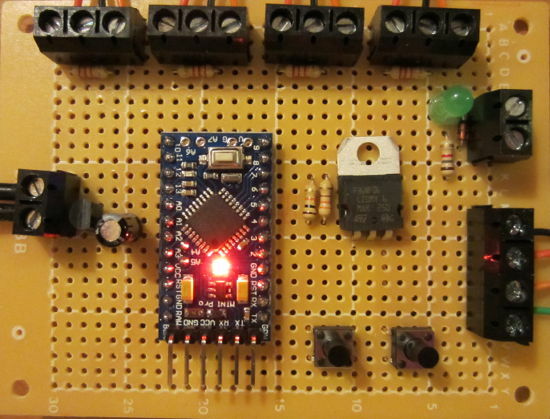 This controller has connections for three waterproof digital temperature sensors – one for the East array, one for the West array, and one for the hot water tank (or pool). The customer for this controller did not want to have the water flowing through both solar arrays at the same time to prevent heat collected on the hotter sunny side of the roof from being immediately radiated away from the cooler side. Therefore his system features two solenoid water valves which, when the pump is turned on, will ensure that water only flows through the hotter of the two solar heating arrays. The display (LCD) for this controller shows the three measured temperatures on the top line, the temperature difference between each solar array and the hot water tank (or pool), which if either of the valves is open (therefore also indicating that the pump is running), and the temperature difference (diffON or diffOFF) required for the system to change state (i.e. for the pump to turn on or off). In the above photograph, the valve on the West side is open, and the west solar array is +5.8 degrees Celcius hotter than the hot water tank. When this temperature difference falls below 4 degrees (diffOFF), as the East array is relatively cool (just +1.2 degees hotter than the tank) the West valve will close, the pump will turn off, and the display will now show diffON – the temperature difference required before the pump can be turned on again. (If the East array had been hotter than the tank by more than diffON at this time then the pump would keep going, the East valve would open and the West valve would close). This controller also has a manual override facility which lets the user force the pump to run with the East valve open, the West valve open, or even both valves open at the same time – for example while testing. The values of diffON and diffOFF can be set by the user as per the standard 2014 solar water heating pump controller. If you need a controller like this (or any other solar water heating pump controller), please email neil@reuk.co.uk with details of your exact requirements. Pictured below is a solar pump controller we recently built to meet a specific requirement. A solar water heating panel is used to heat the water in a hot tub, but if the hot tub exceeds a maximum temperature for comfort, then any additional solar hot water is diverted to heat the contents of a cylinder used for domestic hot water. 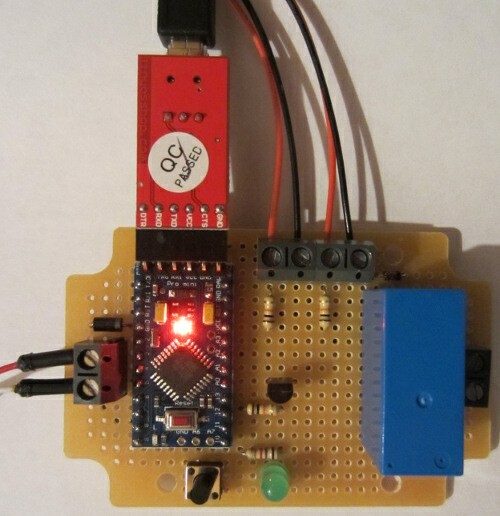 This controller is closely based around our standard 2014 Solar Water Heating Pump Controller with LCD Display, but with the addition of a third sensor to measure the temperature of the cylinder (since we only want to send water from the solar panel to the cylinder if the solar water is hot enough to heat it up). If/when the temperature measured of the hot tub reaches or exceeds the user’s desired maximum for comfort, a three-way solenoid valve is energised automatically diverting the hot water from the solar panel to the cylinder . The pump then carries on pumping until either the hot tub’s temperature has fallen by a couple of degrees, or the solar panel cools to close to the cylinder temperature. All sensors used are waterproof digital temperature sensors, and the display is enables the temperature of all three monitors to be constantly monitored. A solid state relay is used to switch the mains powered circulation pump on and off. If you need a solar water heating pump controller, please take a look at the selection of units we have in the REUK Shop. If you do not find exactly what you need, please email neil@reuk.co.uk with details of your requirements. 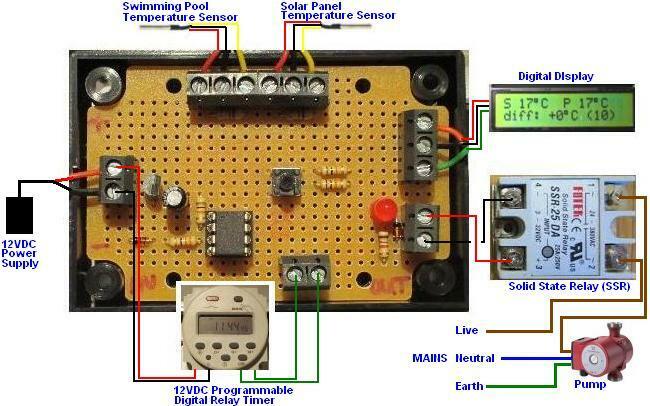 Pictured below is a modified version of our standard 2014 Solar Water Heating Pump Controller with LCD. In addition to the standard digital temperature sensors for the solar water heating panel and the hot water tank, this version adds a third sensor to measure ambient air temperature, and a fourth to measure the temperature of the top of the hot water tank. The LCD display has been modified to show the solar and hot water tank temperatures for five seconds, and then the ambient air temperature and top of tank temperatures for five seconds. The bottom line of the display still displays system status and settings information to the user. If you need a bespoke solar water heating pump controller, please email details of your requirements to neil@reuk.co.uk. 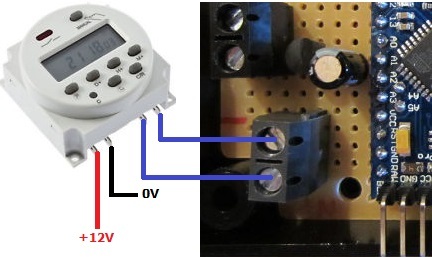 In our blog post Solar Water Heating Pump Controller with LCD we showed a controller which incorporated a timer override so that the user could force the pump of their solar water heating controller to run at certain times of day or night – for example in the winter to protect against frost, or for any other reason. This has proved to be quite a popular added feature, so we can now also offer it on request to our 2014 Solar Water Heating Pump Controller with LCD. The controller works exactly per the standard 2014 controller, just with a pair of added screw in terminals to which a manual switch or suitable programmable timer switch can be connected for more control. If you require a solar water heating pump controller with this added feature, please email neil@reuk.co.uk with details of your requirements. Pictured below is another of our solar water heating pump controllers – this time with digital waterproof temperature sensors (DS18B20), and an LCD to show the measured temperatures of the solar heating panel and swimming pool as well as system status and for the user to programme in the settings. As this controller is to be used in sunny Australia it includes a pre-programmed maximum temperature override to prevent the swimming pool from getting too hot. When the pool is measured to 31 degrees Celcius or hotter, the pump will not to be turned on again until the pool temperature has fallen to 28 degrees. Pictured above is the LCD showing the solar panel temperature of 26 degrees C, and the pool at 32 degrees C. Therefore the pool is too hot and even when the solar panel temperature increases, the pump will not turn on. 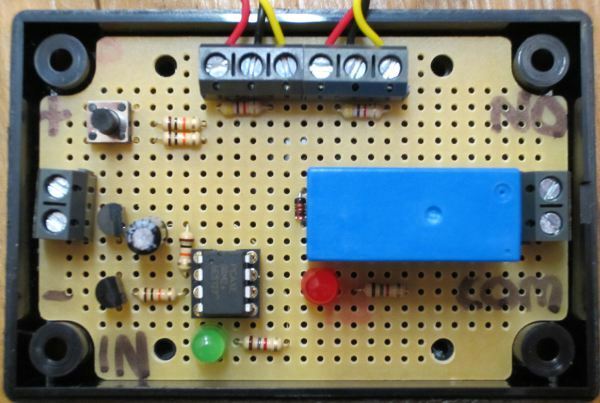 At the bottom of the circuit board is a pair of screw in terminals which will be connected to the output from a 12V programmable digital timer. 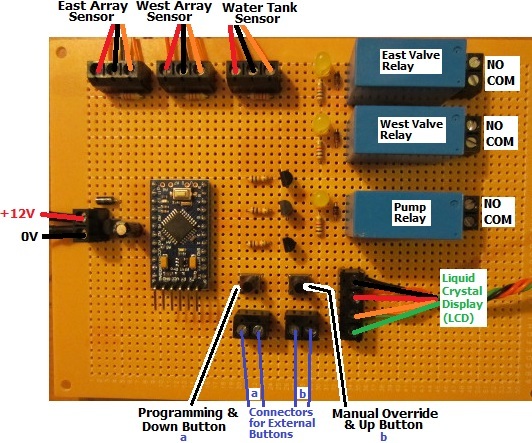 In the winter, the customer for this controller wants to be able to automatically run the pump at the same time each day for a certain time just to circulate water around the system. If you need a solar water heating controller for any application, with or without a display, email neil@reuk.co.uk with details of your exact requirements. 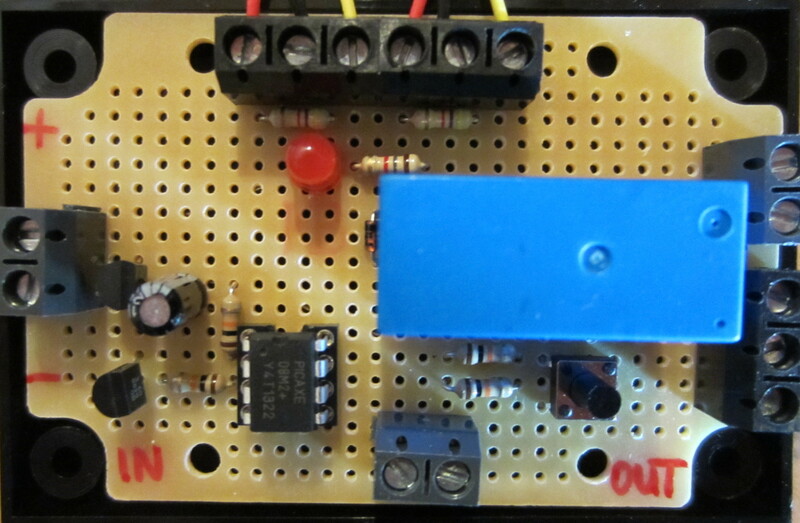 Pictured below is another of our solar water heating pump controller variations. 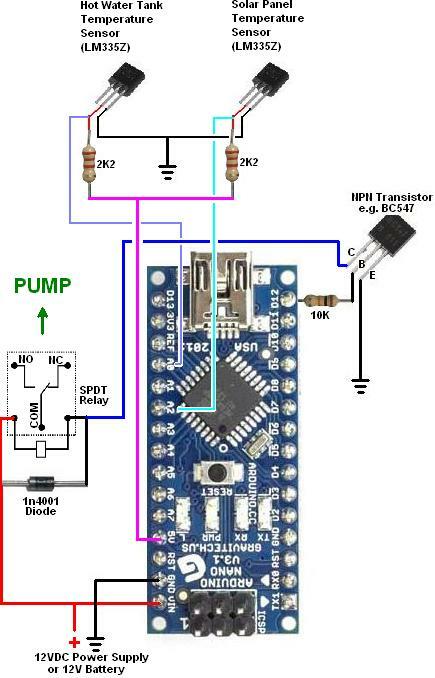 Again based on our 2013 solar water heating pump controller with relay, this controller is modified to use digital waterproof temperature sensors (ds18b20), and also to have a user programmable temperature limit. This controller is designed to be used with solar heated hot tubs and jacuzzis. As the volume of water in a hot tub is relatively small (compared to swimming pools for example) it is possible for the water in the tub to become unpleasantly or even dangerously hot after an extended period of sunshine. 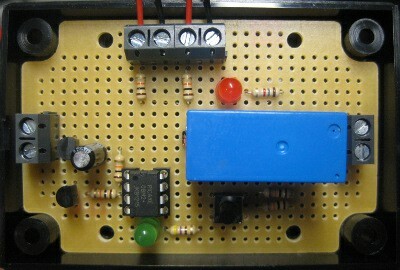 This controller has been modified to have a user programmable maximum temperature. When the temperature of the water in the hot tub reaches this maximum, the pump will turn off and stay off until the hot tub temperature has dropped by at least 2 degrees Celcius. 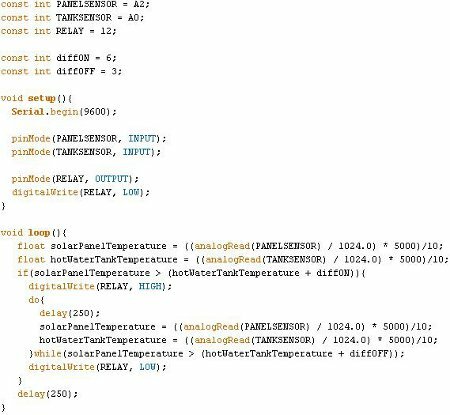 Programming the maximum temperature is simply the matter of holding the button to enter programming mode at start up, then pressing it X times where 20 + 2*X is the desired maximum. For example, 8 presses for a 36 degree Celcius maximum. If you need a solar water heating pump controller for a domestic system, swimming pool, or hot tub, with or without an LCD display, email neil@reuk.co.uk with details of your exact requirements. Pictured below is the connection diagram for a new solar water heating pump controller we designed and built recently for use with a swimming pool heating system. The LCD constantly displays the temperature of the outlet from the solar thermal panel (S) and of the pool (P). 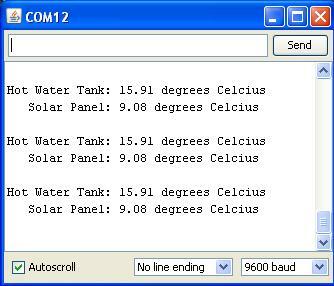 It also displays the current measured temperature difference between the solar panel and pool, as well as the temperature difference required for the pump to turn on or off (as programmed by the user). Having the LCD makes it possible to add a lot more features to this controller on request – for example keeping track of the average temperatures and peak temperatures of the pool and solar panel, tracking for how long each day the pump is running, and many other potential datalogging features. Email neil@reuk.co.uk if you need a solar water heating pump controller with or without an LCD and datalogging with details of your exact requirements. Our 2013 Solar Water Heating Pump Controller is one of our most popular products offering user programmable automatic control a the pump in a solar water heating system. Today we finished an updated version of this controller which offer frost protection. Solar water heating collectors and the associated pipework can be damaged by freezing. One way to avoid this is to pump warm water from the hot water tank around the collector(s) when the ambient temperature outside gets close to freezing. This turns the collector into a radiator, radiating heat from the warm water through the pipes and collectors which prevents them from freezing. In general we recommend that solar water heating systems be drained in the winter to ensure that freezing and the associated damage cannot occur, but we made this particular controller for a customer in Canberra, Australia whose solar collectors have survived for 30 winters without coming to any harm. Also, although their are frosty nights in Canberra, it does not tend to get very very cold there. The modifications to the controller make it turn on automatically at a user programmable low solar collector temperature (e.g. +5 degrees Celcius), and then turn off when the collector temperature has increased by 2 degrees. This will have the effect of keeping the solar collector from freezing, but the side-effect is that the temperature of the water in the hot water tank will go down. If you need a controller with frost protection, please contact neil@reuk.co.uk with details of your requirements. It is however only suitable for use in areas with occasional light frosts – otherwise we still recommend draining the system for its protection in the winter.